What makes us feel safe? Is the definition of security universal or does it differ from country to country? These are some of the questions the new online Global Security Matrix tries to answer. Developed by the well-respected Choices Program, an education program about history and current issues based at Brown University, the Global Security Matrix is an interactive tool that helps students explore how various threats to security affect different levels of society. The matrix is a grid of eight major threats (Warfare, Terrorism & Crime, Malfunctioning & Uncooperative States, Resource Scarcity, Pandemics, Environment, WMD Proliferation, Economic Insecurity) and six types of actors (Human, Network, State, System, Global). 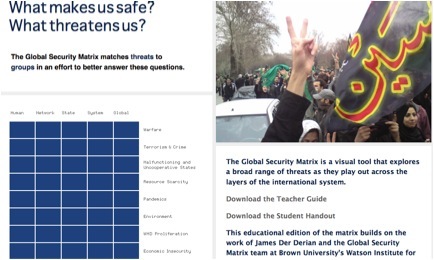 By clicking on a box in the Global Security Matrix, students are offered a list of reports, videos and resources representing the intersection between the threat and the actor. Students can also click on one of the broader categories to learn more about each particular actor or threat. The Choices Program has also provided a teacher guide and student handout to promote discussion and critical thinking. The topics and articles can be difficult and are therefore geared toward high school and college students. The Choices website also offers other curriculum units, film guides and a Teaching in the News program that combines lessons with headlines in the news.